The car pulled in front of the house five minutes earlier. In my rush to leave the house to get to my chiropractic appointment on time, I forgot one of the strawberry chocolate tartlets I had made earlier in the day, that I meant to bring to my friend H., my chiropractor. P. being stuck at work, I had to call a taxi at the last minute. My taxi driver was Armenian and chatty. And extremely polite too. The United States a land of immigrants? Of course, we all know that. “In 2000. But I still feel a stranger here, you know?” he responded. His accent was stronger than mine. It takes many years before this feeling, being a stranger, disappears ; sometimes even a lifetime. And sometimes it simply never disappears. There is not one single experience. When I stepped out of the car, I wondered whether he would continue the conversation with the next customer. I was really glad to see H. : my foot needed it, and I also needed him to encourage me, to tell me that I would be fine next week when walking the streets of Florence, Siena, Cinque Terre and Rome. I’d never sprained anything before, so I had no idea about how long it would take to heal. As expected, H. helped a lot. H. is incredible that way. He has magical hands, as I like to joke. “I forgot a dessert for you at home,” I told him while he was massaging and moving my foot around. I grimaced in pain. “Yes I did. Sorry!” I said with a smile. I was feeling sorry too, but I laughed at the same time. It was quite amusing to tease H. and see him somewhat upset. H. is quite a gourmand and I know that he loves chocolate. “Right, rub it in!” he answered, with a smile. He was the one who once came over for dinner and ate three chocolate pots de crème made for dessert. I think that if there had been more, he would gladly have eaten it. “Are you able to come and pick me up?” I asked P. when I called once outside H’s office. These are the days when we regret not having an automatic car. Driving a stick shift with a left sprained ankle is not working too well! My second taxi driver was Haitian this time, and just as chatty as the first one. He spoke about the weather, and how happy he was that spring was finally here. “I don’t know, I think winter was real long this year,” he said. “Dunno why.” At that point, I think I must have already switched off. I was thinking about dinner, even if I knew that there was a big chance that I would dine alone. He was disappointed. We both love fresh mackerels. I set the table to eat dinner: a fingerling potato salad and oven roasted carrots, beets and leeks with thyme and ginger accompanied my fish, and in view of the situation, I would have plenty left for the next day. I put the food away and walked into the living-room. 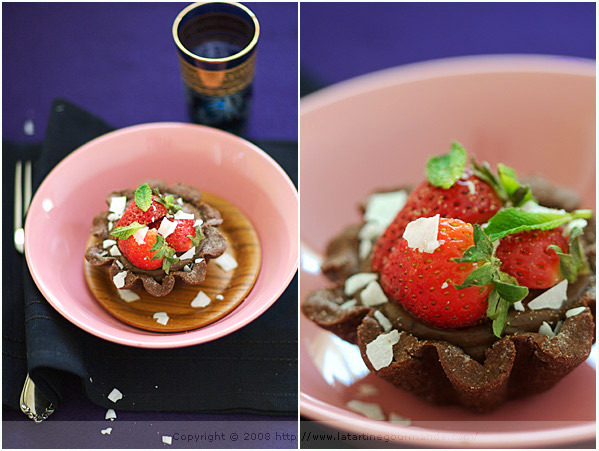 How could I possibly forget about the tartelette au chocolat et aux fraises I had teased H. about! Even if dining alone, I would surely not skip this important part of dinner. There is nothing complicated in the making of this dessert. You need a sweet chocolate crust (plan ahead and make it the day before), chocolate custard and fruit. My sweet chocolate crust used white rice flour, cornstarch, confectioner’s sugar and cocoa; I made the chocolate custard using unsweetened soy milk — I use the brand Silk — because I was curious to see whether I would get a custard as nice as if using cow’s milk. Well for anyone skeptical, you should really give it a try as it is really just as lovely. I did not miss anything in the taste. Actually I preferred it even, finding it somewhat lighter. I sat down in front of TV5 and savored my treat with a cup of white tea. I actually enjoyed eating my tartlet solo. *This crust uses white rice flour, which you can substitute for all-purpose flour. You should then have the same flour weight. Follow the instructions to make the chocolate crust and once in the molds, prebake for 15 min at 350 F. After a few minutes, unmold carefully and let cool. Heat the milk with the vanilla bean and seeds. When it reaches boiling, stop and cover to infuse for 15 min. Strain and reheat; keep warm. In a pot, beat the sugar with the eggs yolks until white and fluffy. Add the cornstarch and mix. Add the milk slowly and return the pot to the heat. While stirring constantly, bring the cream to a boil and cook for 1 to 2 min. It will thicken. Add the chocolate and cocoa powder, and mix well. 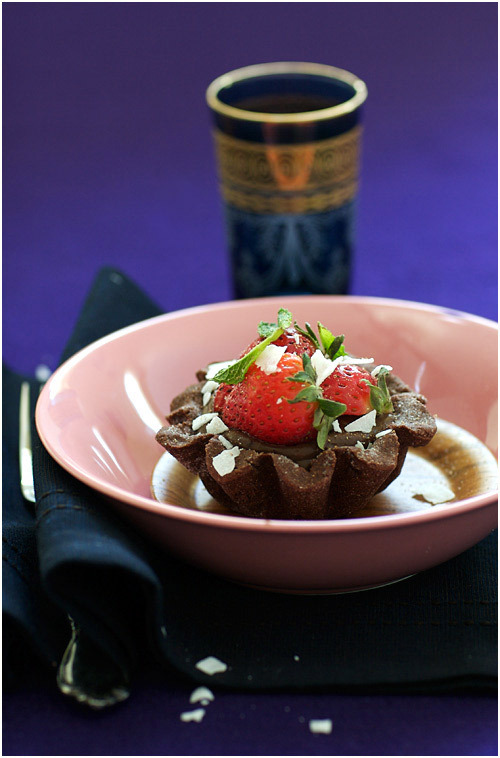 Pour the chocolate custard in a bowl placed in a recipient full of iced water, and let cool. When it is slightly cooled down, add 1 tablespoon butter and stir well. Use the custard right away, or place it in the fridge, covered until ready to use. 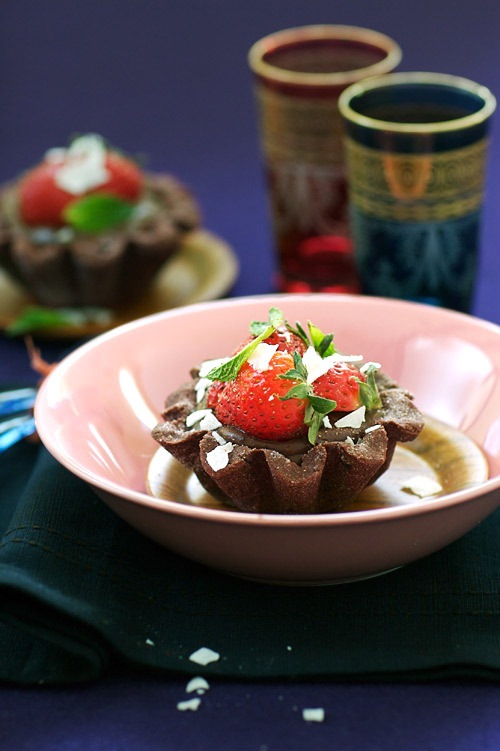 To assemble your tartlets, garnish the chocolate crust with the chocolate custard. Add the diced strawberries, coconut shaves and mint leaves. Enjoy! *Cette pâte utilise de la farine de riz blanc, que vous pouvez remplacer par de l farine type T45, si vous préférez, à condition d’avoir le même poids. Préparez la pâte sablée en suivant les instructions et une fois vos moules foncés, faites précuire les fonds de tartelettes pendant 15 min au four préchauffé à 180 C. Laissez un peu refroidir et démoulez-les sur grille. Dans une casserole, faites chauffer le lait avec les graines et la gousse de vanille. Faites infuser à couvert hors du feu pendant 15 min. Filtrez puis faites chauffer à nouveau. Gardez au chaud. Dans une autre casserole, battez le sucre avec les jaunes d’oeuf jusqu’à blanchiment. Ajoutez la maizena et mélangez. Versez le lait chaud en petit filet sans cesser de remuer et remettez la casserole sur le feu. Tout en remuant constamment, amenez à ébullition et poursuivez la cuisson pendant 1 à 2 min. La crème épaissit. Hors du feu, ajoutez le chocolat fondu et la poudre de cacao et mélangez bien. Versez la crème au chocolat dans un bol placé dans un récipient rempli d’eau glacée, et laissez un peu refroidir. Puis ajoutez le beurre et lissez. Utilisez la crème de suite ou mettez au frigo (couvert d’un film alimentaire) jusqu’à son utilisation. Pour assembler vos tartelettes, garnissez les fonds de tartelettes de crème au chocolat. Ajoutez les fraises coupées en morceaux, la menthe ciselée et la noix de coco, si vous aimez. Régalez-vous ! Hope your foot gets better. Enjoy Italy, I’m sure it will be wonderful. And merci for the beautiful dessert. Looks lovely as always. Have a good trip, Bea. Can” wait to see your photos and hear about all the wonderful food you tasted. Buono viaggio! Sprains are a bum, especially ankles for some reason. Anytime I’ve sub soy milk I’ve had excellent results and lightness is always welcome. Sorry to hear that you sprained your foot. I hope you feel better soon so you can walk a lot on your upcoming trip and bring us back some beautiful pictures 🙂 These tarts look simply delectable! Eh bien, je me régale déjà avec les yeux. C’est aussi une partie du plaisir. I’m sure that this tart helped your foot feel better! Have a wonderful trip to Italy. Wonderful pictures and recipes as always. Where did you get those beautiful little glasses!! They are georgeus. Please let me know. I hope your foot gets better soon! This tart would certainly cheer any day up! Oops! Please excuse my typo. I can’t wait to hear about your Italian adventures! hi Bea – I’m a fan of your blog ..everything is beutiful..
I’m based in Siena and I hope you’ll enjoy your visit here. One thing to do is an aperitivo at Bar Conca D’oro (Nannini on via Banchi di Sopra) and try their house cocktail, Conca D’oro – just another Sienese pass time ..
beautiful…i’m intrigued by the gf crust! Those chocolate tartlets look scrumptious Bea! If it had been me, I’d have been tempted to skip dinner altogether and go straight for dessert! Hello Bea, I am still harping on the plastic liners topic. I’ve asked u once before. http://www.latartinegourmande.com/2008/02/05/meyer-lemon-mousse-tonka-bean/ Try as I might I havent managed to find them here in Germany. What else could I use to line mousse forms? Any ideas? I love the sound of the chocolate crust without flour, and it looks so beautiful too! J’espère que ton ami chiro ne lit pas ton blog… a voir ce qu’il a manqué, il risque la dépression! this has me craving to make tartlets with strawberries. Gorgeous as usual , Bea! Nothing like a little political conversation to go with your cabride! Congrats on an excellent looking dessert – should your friend read your blog, ii’m sure he will regret missing out. There is always next time though. I have had tartlets, but never attempted to make any myself. Perhaps it is time to try! 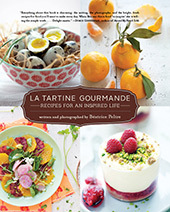 Ces tartelettes sont tout simplement magnifiques et outrageusement gourmandes… J’adore! Vivement la saison des fraises! J’espère que tu continueras à nous révéler de délicieuses recettes gourmandes de saison telles que celle-ci! Seriously, I do hope your foot feels better by then, mine would with such a tart!! Hi I manage a BBM for childhood come here to visit it ! Many thanks everyone. Foot is on the mend, so I am pleased! The GF crust is a must try Aran ! 😉 And also, many thanks for all your Italian recommendations! I cannot wait! I’d NEVER forget these tartlettes! That looks delicious! I’ve been thinking a lot about immigration lately because I’m studying immigration law (in the US) and all the rules that make it so tough to come here and even tougher to stay, and just how hostile everyone is towards immigrants. I wonder if it will be the same for me when I emigrate to France. I know citizenship will be extremely difficult to get, but I also wonder how hard assimilation will be. I’m a bit afraid of the bureaucracy, and my French is very good but not perfect. :-/ Well, I still have a couple of years to figure it all out. Shy, I have not yet done it but I bet parchment paper would work too. Just a little more difficult to put in the circles. But same principle, so that the cream does not stick to the ring mold. You simply have to peel off then. Marie-Clemence, merci beaucoup de ton gentil commentaire. Les moules sont en fait des mini-moules a brioche. A bord haut. 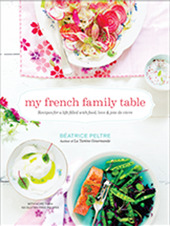 Iris, I forgot to add, I had purchased the glasses at Sur la table. Good luck! Hey, these look georgeous! Was wondering, do they freeze well? how long can it last in the fridge? C´est toujours avec plaisir que je viens sur ton blog!! La recette est notée, reste plus qu´a attendre de bonnes fraises! Your photos and recipes are so amazing…you are my food hero. I have been inspired by your blog for a long time and have been dying to ask you about which lense(es) you use for your foody pics? but have felt shy, so here it is! Thank you for sharing your wonderful and creative adventures, both in and out of the kitchen. You are a true inspiration.